I worry tremendously about my cat while I am away. How will I know he/she is doing okay? Here at The Comforted Kitty, we completely understand your great concern for your beloved feline’s well-being while you are away on vacation or business. It can be a very nerve-wracking and stressful experience, wondering about them and how well they are doing in your absence with a pet sitter. All of us at The Comforted Kitty are cat guardians ourselves and share the same thoughts and concerns when we are away and hire in-home cat sitters for our kitties. 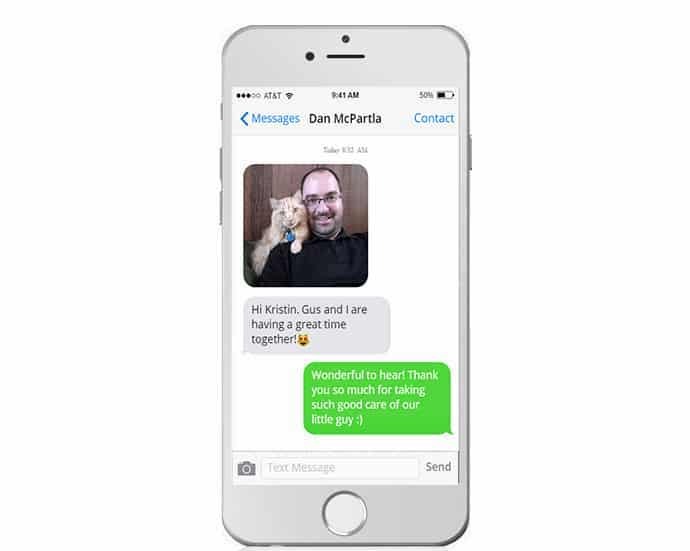 We want the best cat sitter for our cats as much as you and we know how hard it can be to find a trusted local cat sitter. That is why we proudly include daily visit updates in all of our sittings we have booked with your cat. We will happily send them to you via text, email, or phone (whichever you prefer), and explain in detail such things as your cat’s appetite from the previous visit, litter box usage, mood and energy level, activities they engaged in with the cat sitter (playtime, brushing, lap sitting, etc. ), and any issues, concerns, or questions that came up during the visit. And, of course, we will happily attach several photos of your kitty for you to see! Just seeing your cat’s face can make a world of difference when you are away and miss them so dearly :). We closely monitor the health and well-being of your cat, our trained and experienced eyes recognizing and notifying you immediately of any abnormal or concerning behavior, such as reduced appetite, listlessness, vomiting, diarrhea and any other distressing symptoms. And if any emergencies or critical health issues arise that require immediate medical care, with your permission we are very ready to take your cat to the nearest emergency veterinary hospital of your choice for immediate treatment and keep you updated on all of the progress. Unlike even the best well-intended family, friends, and neighbors, we have a contractual obligation to you, your cat, and your home, and we take this responsibility extremely seriously. You can always count on our reliability, responsiveness, and open communication with you about any and all of these matters related to the well-being of your cat and home while you are away. We will always keep you updated on such observations so that there are no unwelcome surprises upon your return home. We give prompt responses to all of your follow up messages and we make sure to answer every question you have during your vacation. We want to make sure that we are always following your precise directions in proper care for your cat so they remain happy and healthy, ensuring that you enjoy your vacation and not worry about the safety and welfare of your cat and home. We cherish the peace of mind we provide to you and your family through daily updates that show we are there for your cat and fully engaged with them. Read more of our stellar testimonials and rave reviews on our website here and also on our Yelp page here!